National Independence Day Parade - July 4th, Washington, D.C. Nowhere is there greater excitement on America's birthday than in the nation's capital. The National Independence Day Parade in Washington, D.C. takes place annually on July 4th. The parade is a patriotic, flag-waving, red-white-and-blue celebration of America's birthday. An enthusiastic audience numbering hundreds of thousands gathers to view the procession of invited bands, military and specialty units, and floats. 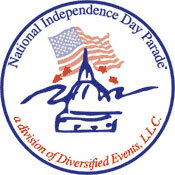 The parade travels on Constitution Avenue along the National Mall from 7th to 17th Street. The parade is co-hosted by the National Park Service and produced by Diversified Events, which is under contract to the National Park Service. Also involved is Music Celebrations International which has selected and provided arrangements for bands marching in the National Independence Day Parade for many years. The National Selection Committee's goal is for the parade to include representation from all parts of the United States. Marching bands interested to participate must submit a recording, photos and biographical information detailing experience and honors such as past adjudication results or festival ratings. Marching bands are selected on the basis of overall quality and geographical, ethnic and stylistic diversity. 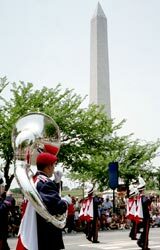 Many participants and band directors have enjoyed experiencing the patriotism, inspiration and spectacle of July 4th in the nation's capital. It's a place and time where people put aside differences and unite to celebrate the birth of this country and the freedoms it preserves. The National Independence Day Parade is a substantial part of, but by no means the only, excitement of being in the nation's capital on July 4th. • A National Folklife Festival on the Mall features different cultures in the Americas and a variety of ethnic groups. 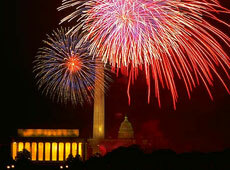 • In the evening, parade participants are part of the audience of "A Capitol Fourth"  the PBS Concert at the Capitol Building, featuring the National Symphony Orchestra and one of the country's largest fireworks displays.